Call NOAH Pet Clinic for an appointment! We are sad to announce that Dr. Michelle Leathem has left NOAH to pursue another professional opportunity. Dr. Joy Sizemore, who has been practicing at our Sandusky office since September 2018, will begin seeing patients at our Milan office in mid-March. Dr. Lynn Arnold will also continue seeing a limited number of appointments each week. Drs. Aaron and Hannah Ison will remain the primary veterinarians at our Sandusky location. Due to pre-existing commitments on behalf of our doctors, we will experience a temporary schedule change. From April through June 2019, the Milan office will be closed on the 2nd and 4th Monday of each month. Our Sandusky office will be open as usual, and we will be able to accommodate any Milan patients requiring care on those days. We appreciate your patience during this time of transition. We are thankful for all that Dr. Leathem has done for our practice, our clients, and our patients over the years. We are locally owned and operated. Long-time associates of CritterCroft Pet Clinic, Drs. Aaron and Hannah (Crecelius) Ison purchased the practice from Dr. Lynn Arnold in October 2013. NOAH Pet Clinic provides comprehensive healthcare to the cats and dogs in Milan/Sandusky and the surrounding areas. Your pet's care is tailored to them by your veterinarian. We offer a wide variety of medical, surgical and dental services. As we continue to grow, we plan to expand the practice, providing additional advanced diagnostics, treatments, and services to better serve you and your beloved pet. In order to provide the best quality care, patients are seen by appointment only. Please call our office today at (419)625-2484 -Sandusky or (419)499-4949 -Milan for all your pet health care needs. If you have an emergency during our normal operating hours, head directly to one of our clinics. If able, please call to let us know when to expect your arrival, so that we can be better prepared to treat your pet's illness or injury. If you have an emergency when we are closed, please call the main telephone number for either clinic and press 1 when prompted to be transferred to licensed veterinary professional, who will help you to determine whether or not a trip to a full service emergency facility is necessary, or if your pet can wait for a next day appointment with us. If you are instructed to see emergency care, please contact Animal Clinic Northview at (440) 327-8282. Clients who live in Ottowa or Sandusky counties may wish to contact MedVet Toledo at (419) 473-0328. These facilities are able to provide overnight critical care and monitoring. Please browse our website to learn more about our practice. 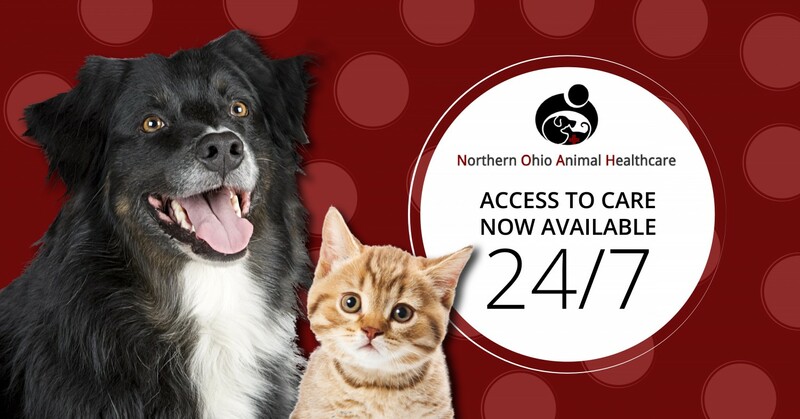 Northern Ohio Animal Healthcare recognizes the importance of protecting the personal privacy of its clients, its patients and those individuals who simply visit our site. Your privacy is also protected in our clinic. At no time is any information given out about the client or the pet without the consent of the client.